Yep, I published two books! !! !New Book – Open Season!!! ← Yup, I’m annoying. It’s a talent. Homework – To Nag or Not To Nag? It was 10pm last Sunday night and I knew where my children were, two already asleep and my 12 year-old on the verge. Immediately I went from a sleeping dog to one who senses danger. I’m at attention, ears perked, heart pounding. As usual, I had reminded him about his homework at least half a dozen times; more, if you counted the silent but overt raised brow directed at his untouched backpack. In response, I had been ignored, grunted at and eye-rolled. My bright goodnight smile darkened and my arm tickling sweet circles on his back halted. “Are you kidding?” I asked, although clearly it was a rhetorical question. He was not kidding. The next morning when all that was left of the insanity was a harried overtired mom and a cranky child; we had a discussion on time management, his responsibility to his work and of not making me the nag. It was brief, as the circumstances seemed to speak for themselves. Waiting till the last minute is something I have a hard time understanding. When I have an assignment, I’m at it the first chance I get. How else could I double check, edit or revise? How could I even sleep with the ‘assignment’ looming over my head? The answer is that I can’t. Which is why barring a special circumstance, my children do their homework when they come home. This worked fine through elementary school, but now that my oldest is in middle school, the same rules don’t apply. First off, he doesn’t always come home right after school. He plays on the school soccer team. He also plays in a basketball league and of course there’s his year round baseball training. On top of that he attends Hebrew school two days a week and has just started guitar lessons. I’m sure it seems like a lot but he loves and manages it all, and if something has to give, it gives. As long as it’s not his schoolwork. Thankfully he’s a good student, but weekends are especially challenging and I admit to tossing semi-constant reminders very subtly his way – ‘What would you like for lunch? Hey, did you do your homework? Okay, grilled cheese’. But this weekend, I vowed not to be the nag and to make him responsible. So I reminded him on Friday evening and told him he was on his own. Then I watched the hours and days pass with mounting anxiety. Would he forget? Could I let him go into school unprepared? I really didn’t know if I could, even if ultimately the lesson was to his benefit. Thankfully, I wasn’t put to the test. 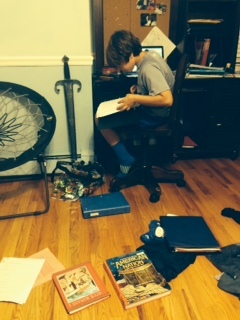 Sunday evening I found him sitting in his room, his book bag flattened, an explosion of binders and books strewn about. He caught my eye and gave me a self-satisfied smile. Nothing better than knowing your nag isn’t a nag. Okay, so it’s 9:15pm. Baby steps. Posted in Boys! and tagged homework, mother, nagging, parenting. Bookmark the permalink. Mama to 3 boys, wife to Mr. Baseball and daughter of a sad man. I have a double scoop every day. Scott! Twin Daddy!! Hey there! Nice to see your happy face!! The first time I decided not to be the ‘nag’ and didn’t do any reminding, it was brought to my attention that it was my fault the homework wasn’t done and the tests not studied for. Surely not! I really think they like that nagging. LOL! i really want to try that, but i know it will be the exact same – my fault and i’ll feel terrible! can’t win! ha! I’ve always tried really hard not to be a nag too. I just do a gentle reminder and leave it at that. Sometimes he forgets and sometimes he actually did it — but it’s all on him. you’re strong!! maybe it’s getting over the first time and letting him fail. ugh!! I’m so scared of homework. My kids don’t have it yet, but I’m bookmarking this post for when it startes. honestly, middle school changes the game. I’ve got elementary down. I thought he was kidding. He wasn’t really. The last few years of high school he would get up in the middle of the night, “remember” the homework and work on it after I was already sleep. I’m of the “do it the second it’s assigned so I can sleep at night” mind, so I totally get you. I would be having anxiety and night sweats for me if it were my kid. it’s never a good thing if you’re not sleeping because someone else has unfinished home work. ha. I quit nagging when they went to college…not one minute before. I figured that they could dig ditches for a while if they decided not to study. It worked out fine. I like this post…it took me back to a very happy time in my life. oh, i’m still the naggy mom. Ah! The constant battle. I know these moments well. i’m stressed even writing after tonight’s escapades that are nowhere near complete. As a teacher, I can say that some lessons are taught as consequences. Middle school content will never make or break anyone. But habits formed in middle school can be hard to break. I would offer reminders, but, at some point, you have to let the chips fall where they may, so to speak, with the understanding that, should a bad grade result because of poor time management, there will be a negative consequence at home, such as a temporary loss of privilege. It must be hard, but balance and consistency are essential. Good luck. thank you so much. i know you’re right but it’s sooo hard! I did not do well with my own boys and homework. The bulk of it came during the worst years after my separation and divorce. It sounds like you’ve taught yours well the value of getting things done and being prepared. ah… it was a good moment but every day is another story. i’m with you! then maybe i’ll do better with the younger ones. ha! I hate homework! My kids hate homework and they’re only little yet I can’t imagine… 😦 This ending was sweet though, what a good boy! This was such a hard one for me to navigate as a parent! So glad those days are over for us. Sure sounds like you are handling it well. Oh man, that would have given me heart palpitations! My son did that once, but with a huge project that was due the next day. We almost killed him. Besides the fact that a reminder was written in his planner every single day for weeks and his teacher kept reminding him, we had no idea as he never mentioned it. We were very clear that that was never to happen again. He does his homework when he gets home every night and if there is a project, I am on him repetitively to start it and get some done each night and not leave it to the night before. I feel no shame or guilt over that. You do what you have to do, momma!! i thought we were making progress but i just came back from having to drop off the work he forgot to take to school this morning! haha! Well done for giving him the space to make his own decision. It’s something I struggle with too and I’m a nervous Nelly at weekends if I haven’t seen them heading towards homework before Sunday afternoon! i hear you – i start to twitch! I have to bug my 10yo. And the double check that he really did everything. He’s already forgotten to bring (finished) assignments back twice. Sigh. Get a Spoon and Dig in!!! I’m still here. Only with lower standards. I’m Not Going Anywhere, Kid. You may have missed these!! Now you don’t have to! Whew!